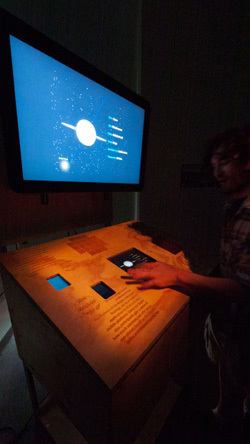 The Kepler Explorer app is part of an exhibit to be installed at the Lick Observatory visitors gallery. 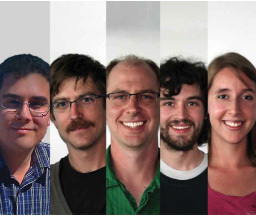 The Kepler Explorer team includes (left to right): Eric Lopez, Kyle McKinley, Jonathan Fortney, John Peters, and Caroline Morley. 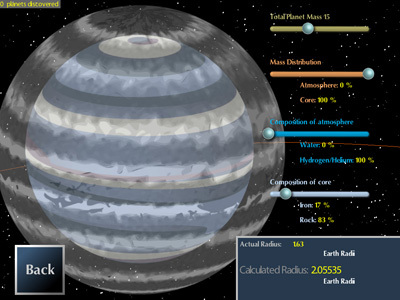 Kepler Explorer challenges users to design a planet that matches the Kepler data. Armchair explorers of the cosmos can now have at their fingertips the nearly 2,000 distant planetary systems discovered by NASA's Kepler Mission. Kepler Explorer, an innovative app for iPads and iPhones developed by a team at the University of California, Santa Cruz, provides interactive displays of newly discovered planetary systems based on Kepler data. Now available for free from the iTunes App Store, Kepler Explorer was developed through the OpenLab initiative at UC Santa Cruz, which brought together faculty and students in astrophysics, art, and technology for a summer institute last year. The Kepler Explorer team includes astrophysicist Jonathan Fortney, a member of the Kepler science team; two of his graduate students, Eric Lopez and Caroline Morley; artist Kyle McKinley, a recent graduate of the Digital Arts and New Media program; and John Peters, a recent graduate of the computer game design program. "I learned a lot about astrophysics from this project. It was a lot of fun," said Peters, who wrote all of the software code for the app. Fortney, an associate professor of astronomy and astrophysics at UCSC, said he enjoyed the opportunity to work on a project that could reach a wider audience than most of his research. The team quickly settled on the idea to create an app, and also developed it into an exhibit that provides additional information and shows the app's output on a large screen. The exhibit was part of two OpenLab public exhibitions last year, one at the UCSC Digital Arts Research Center and another at the Tech Museum in San Jose. It is scheduled for long-term installation in the Lick Observatory visitors gallery later this month. Kepler Explorer starts with drop-down menus listing all the Kepler-discovered planetary systems, plus our own solar system. The selected system is displayed in a view that shows the planet or planets in their orbits around the host star. Shown in real time the planets look motionless, but moving a slider increases the speed until the planets zip around their star. The touch screen lets users zoom in and move around the system, and tapping on an individual planet brings it up for further exploration. Another view shows the relative sizes of the individual planets compared to their host star. Kepler Explorer's most innovative features are seen when viewing individual planets. The user can manipulate the composition of the planet and its atmosphere and see which mixtures of components (iron, rock, water, and hydrogen) are consistent with Kepler's observations. This feature represents graphically the type of in-depth analysis that Fortney does for the Kepler Mission. "I have pretty good intuition for what the likely composition of a planet is based on its size, but the app allows anyone to explore the properties of many different planets very quickly," he said. Because Kepler detects planets as they pass in front of their host star, it only measures the radius of a planet, or how big it is. In most cases, the mass of the planet is unknown. When the mass is unconstrained, there may be different combinations of components that result in a planet of a given size. The app's interactive graphics show how this works. There are sliders for different components and how they are partitioned in the core and the atmosphere, and as you move the sliders the image of the planet grows and shrinks, based on hundreds of calculations. As you change the settings, the app tells you when the size of your planet matches the observations. The calculations involved took hours of computer time, but the results are stored in tables so the app can use them on the fly. "For a large-radius planet, you can very quickly tell that it can't be a rocky planet, for example, and that in itself is pretty informative," Lopez said. So far, the Kepler Mission has detected a total of 2,321 planet candidates orbiting 1,790 host stars. Automatic updates for the Kepler Explorer app will add new planet candidates as they are discovered. Jennifer Parker, an associate professor of art, started the OpenLab initiative in 2011 with astrophysicist Enrico Ramirez-Ruiz, who invited Fortney to participate, and recent graduates Amy Boewer and Jack O'Neill. "We wanted to bring together faculty who are interested in interdisciplinary work with students from a range of disciplines," Parker said. "There is such a vast amount of research on this campus, and one way to share it with the public is to make tangible things and playable media. It's not just about art illustrating science. OpenLab is creating a space for new ways of thinking that can emerge from conversations between different disciplines."